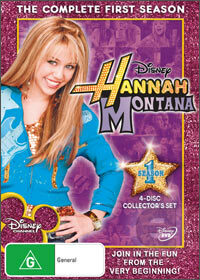 This is it, the complete first season of Hannah Montana so fans can breath a sigh of relief. Not only does it feature all 26 episodes of Miley Cyrus entertainment but it also boasts some great special features such as the first audition of Miley for the series. So who exactly is Hannah Montana? In the series Hannah Montana is an international music superstar, however for Hannah, she maintains a secret identity in order for her to live a normal life. This idea was concocted by her father who also happens to be her real-life father Billy Ray Cyrus (minus the mullet). Miley is also the new teenager in town who has a list of supporting cast members and where the series does shine is through the anecdotes that young Miley gets involved in. It’s a thin line that Miley Stewart crosses in the series as she attempts to jungle her “normal” life and the rock star dream of Hannah Montana. The humour of the series is perfect for anyone and is not too over the top or forced. Definitely one for girls of all ages! Oh Say, Can You Remember the Words? We Are Family: Now Get Me Some Water!